While directed at lawmakers at all levels to advocate for Amateur Radio, the 2015 ARRL publication Amateur Radio: Science and Skill in Service to Your Community is also a good read for the ARES community: the 12-page report provides a summary of major ARES and other groups' operations for incidents and events throughout the regions of the country over the past couple of years. A product of the League's regulatory and advocacy staff, the report shows graphicallyhow Amateur Radio has benefited the United States through public service, disaster response, and partnering with other served agencies. The report will lend even the most grizzled veteran operator pride in what we all do. Click here for the report - don't miss it! Understanding what a CME is and how much forecast lead time can be expected prior to the CME. What effects are associated with a CME and what precautions should radio operators take prior to the CME to protect equipment. Following the CME, operators will begin assessing the effects and begin reporting this information. Twenty new members of the ARRL Ohio Section ARES leadership team spent a day learning from senior leaders about their new responsibilities. The class was conducted at the Franklin County Emergency Management office in Columbus. Freshmen county Emergency Coordinators (EC) and Assistant ECs heard from Ohio Section Manager Scott Yonally, N8SY, Section Emergency Coordinator Stan Broadway, N8BHL, Northeast Ohio District 10 EC Eric Jessen, N8AUC, and Dayton area District 3 EC Robert Rhoades, KC8WHK. When a new EC is appointed, the appointee receives a manual from ARRL HQ covering their new responsibilities in leading a county ARES program. "We wanted to supplement the ARRL training materials with a conversational learning environment where we could put 'real life' into their understanding of their leadership tasks," said SEC Broadway. Speakers at the day-long session brought considerable credentials, experience and expertise to the podium. Rhoades has an extensive background in the fire service and Fire Marshall's office, the Ohio Health Department and is an instructor at the national training centers in Emmitsburg, Maryland. Jessen drew from a large city history of events and interaction with major served agencies. Section Manager Yonally and SEC Broadway share extensive backgrounds in emergency services and planning. Broadway launched the day session with an overview of ARES from its historical roots to its current organization in Ohio. The main concept for session attendees to learn is that the EC is the lead representative of ARES in his county; knowing his jurisdiction and being able to establish and maintain relationships with local partner agencies are missions-critical. The District ECs and SEC are appointed to support the EC, reinforcing the EC's ability to serve the agencies and the public.The session also covered the importance of specific job duties including filing monthly reports. Section Manager Yonally had just returned from a week of training at ARRL Headquarters in Newington, Connecticut, where he was presented with training and information on Field Organization and ARES policies and procedures. He related this knowledge and lessons he has learned through personal experience to the group. SEC Broadway discussed how to establish and maintain a solid working relationship with the EMA Director, and other served agency leaders. Jessen advised "Never write a check they can't cash," which resonated with the group. Other discussion ranged from the importance of presenting a professional image and what it takes to be accepted into the inner circle of leaders at the EMA office. Broadway discussed emergency planning with the attendees, outlining the Ohio Section Emergency Response Plan (OSERP) and how it can be adapted to specific county situations and needs. ECs were advised to talk with their EMA Directors about what Broadway calls the "Ten Worst Headaches" list - an outline of potential problems with the ARES/EMA relationship and possible solutions. The goal is a good working relationship, leading to the overall integration of ARES as a valid emergency resource. One of the top concerns for many county ARES programs is retention, keeping volunteers interested and active. Towards this goal, Broadway suggested holding training sessions conducted by instructors/officials from county served agencies covering topics such as light SAR (search and rescue), First Aid/CPR, anti-terrorism, damage assessment, Red Cross shelter operations, the CERT program, and evolving data modes. The Lessons Learned Information Sharing (LLIS) program is part of FEMA's National Preparedness Assessment Division (NPAD). The LLIS program supports its mission by developing and disseminating lessons learned, innovative practices, and other related content for improvement throughout the whole community; analyzing emergency management capabilities in order to identify common areas of strengths or improvements; and developing policy and doctrine. For example, there is a report on an LLIS page under the heading "Innovative Practices," titled "Amateur Radio Volunteers Protect Community Water Supply." The report, dated October 7, 2014, presented how Federal preparedness grants support Colorado's structured partnership with ARES, "which assists in establishing and maintaining emergency communications during disasters." From the report: "In 2013, Colorado experienced historic rainfall and flooding . . . as part of the response effort, 150 ARES volunteers in Colorado's Northeast Region deployed to assist. When floodwater threatened the electronic controls of a wastewater facility serving a community of 80,000 people, ARES established a microwave network using two grant-funded repeaters and took remote control of the plant. ARES maintained control of the facility for four months -- preventing any wastewater from spilling into the floodwater." More discussion follows in the report. There are many parts of FEMA's LLIS resources that would be of interest to us as radio amateurs and ARES members. Start by browsing here. 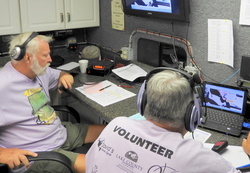 The Lake Amateur Radio Association activated ARES of Lake County (Florida) in support of the 41st Annual Mount Dora Bicycle Festival in Mount Dora, Florida from October 9 -11, 2015. Operators provided radio communications from each rest area as well as from mobile radio units to patrol the various bicycle routes. Lake County has 1400 named lakes and is considered Florida's hill country. Some hills offer a challenge for even the most experienced bicycle riders. This year 1325 cyclists signed up to ride in the festival. issues. Five medical emergencies were managed: One rider required evacuation to the hospital with a broken collar bone. Sixteen situations in total required the intervention of the mobile radio vehicles. The Lake County ARES group used a repeater to run the net, keeping track of rest area locations and mobile radio units. NCS operators used the call sign of N4FLA and assigned all field operators tactical signs. On August 22, 2015, 350 bicyclists and more than 200 support crew covered a 500-mile, 7-day bike tour of Yellowstone National Park. A hail storm on day two blanketed base camp, and a snowstorm on day 3 stranded 55 bikes at the 11,000 foot level. Adding to these challenges were grizzly bears, wild land fire and smoke, and ice-covered tents. A communications collapse during a 24-hour period mid-week resulting in no cellphone coverage, no Internet access, and no landline phone coverage, provided another insult. This was the third year of the Cycle Greater Yellowstone Bike Tourevent, with radio amateurs supporting it for all three years. The ride features a different area around Yellowstone National Park (YNP) each year - exposing riders to new views of the YNP ecosystem. This year's event brought several "firsts" to the local Amateur Radio community. It was the first time that amateurs from four different radio clubs (separated by hundreds of miles) have worked together. The event is the largest that many of the operators have ever worked. It was the first time operators had to cover forest service and wilderness areas with no cellphone towers, no repeaters, nor civilization/infrastructure. It was also the first time that the current ride organizers worked with Amateur Radio operators. The week was physically and mentally exhausting with no down-time for the 34 amateurs. Riders were on the road each day from 7:00 AM until 5:00 PM, but the operators started earlier and didn't stop working until after 10:00 each night. For days three and four, when the riders were in the wilderness areas, Amateur Radio was the only communications service for getting messages in and out of camps, adding stress to operators. Messages were critically important: health/welfare, weather updates on incoming storms, and queries to local hospitals on conditions of injured riders. Operators evacuated at least one rider per day for hypothermia, dehydration, heart and lung issues, and accidents with cattle guards and other cyclists. Hams were assigned in all SAG (Support and Gear) vans, as shadows to two Course Directors and Course Monitors, and at Rest Stops, Base Camp, and Sweep vehicles. Days One and Two were shorter, on level ground, providing a good "shakedown cruise" for the challenges to come. The easier starting days allowed the riders and support personnel time for acclimatization to the higher altitudes. Day Three featured the 31-mile climb to 10,947' Beartooth Pass that divides Montana from Wyoming. Even leaving camp an hour earlier than normal to beat an incoming snowstorm, 55 cold riders had to be evacuated from the mountain. The hams drove a truck to the summit to retrieve the 55 bikes left in the snow. The next morning, all bikes, tents and vehicles wore a thick layer of ice.That night, crew took 2-hour shifts for bear patrol around the perimeter of the cold campground, with each crew member equipped with bear spray and a whistle to summon help -- troublesome bears were present. Day Four saw riders and operators up and over another pass to Cody, Wyoming, where temperatures were much warmer, but with stronger headwinds. Day Six had more seasonal temperatures, but Day Seven found the riders facing a brutal headwind with colder temps, resulting in more than 100 riders choosing to wait for a bus to transport them to the finish line. Of the riders that started, more than half had to be sagged-off the course. The last few determined riders did reach the finish line in Red Lodge, Montana. Ham operators involved - 34. Total time invested by radio amateurs -- 1600 hours. Radios used -- 46 handhelds, 35 mobiles, 12 HF radios, 7 APRS trackers, two mobile digipeaters, 14 FRS radios, and 15 radios on 153.905 MHz for direct communication with medical services. Radios were used by the hams as "High Point Relays" to cover each day's 70-100 mile course. Ten fixed VHF/UHF repeaters were also employed. Operating skill is not something that can be tested on a license exam or learned from a book. Emergency managers know that practice - lots of it - is required for operators to be sharp when they are really needed. Repeating drill after drill can get old but there are other enjoyable ways to give your equipment a good shakedown and build on-the-air know-how. Just as sports keep you physically fit, "radiosport" or contesting can serve as a training ground while having fun at the same time. First, you don't need a huge, multi-tower station to participate. A comm trailer or EOC probably has everything you need for success, particularly if you choose the right contest. You can start simply with any of a number of regional FM simplex contests that encourage the use of mobile and handheld FM radios for an afternoon or evening. Just search the Internet for "FM simplex contest" to find several. For example, in the St Louis area, the St Louis and Suburban Radio Clubsponsors an occasional "ZIP code contest" in which hams operate from home or a car and count the different ZIP codes as multipliers. Operation takes place on the usual simplex FM channels from 147.42 MHz to 147.56 MHz for four hours on a weekend evening.This is a great way to learn about squelch management, copying weak signals, using phonetics, and the effectiveness of good locations and antennas! No contest in your area? Work with the local clubs to start one. Instead of jumping into a big DX contest, try the domestic contests such as the upcoming November Sweepstakes or December's 10 Meter Contest. The low dipole you use for regional communications will work lots of stations - more than you might imagine. A multiband vertical will work great on 10 meters or put up a temporary dipole for the weekend. Farther in the future, check out the North American QSO Parties with their easy name-and-state exchange and low-power signals. Look up your own state's QSO party and activate your county or parish for hours of fun with callers chasing YOU for a change. If your club has VHF SSB gear, there are regular VHF contests. If your team uses digital modes to exchange text and files, try a digital mode contest with RTTY and PSK keyboard-to-keyboard operating. Trying to pack an entire team into the shack can be counterproductive. A couple of people have a lot of fun while the rest watch and get bored. If you have enough interest, divide your group into two- or three-person teams that operate in shifts with an experienced operator to mentor and guide (and log). Better yet, put the teams at different stations and let them go head-to-head in a short challenge. No one says you have to operate the entire contest, either. Pick times that work - maybe about as long as your regular drills - and get together afterward for the usual "hot wash" or maybe just a little story-telling session over pizza. A "contest Elmer" can help those new to contesting with scripts guiding the operators through a QSO. Start each team of operators with a period of listening so they have some time to get up to speed. Show them how to tune in an SSB signal, operate the necessary receiver controls, and the abbreviated style of calling and answering. Using paper log sheets can work at first but you'll find that simple logging software like that available from N3FJP is easy and intuitive to learn. Let one operator talk and one operator log - then swap. Once your team gets up to speed, reinforce the reasons why we have contests in the first place: accurate, effective operating. Place a special emphasis on getting call signs and exchanges 100% correct. Making a lot of contacts is good but not at the expense of errors. Help operators make good use of primary radio controls to increase clarity on receive and transmit: filters, RF gain, AGC, RIT/XIT, and others can make a surprising improvement in copying ability. Watch for teachable moments such as unusual and changing propagation, small pileups of callers, confusing letters, and clean vs distorted signal audio. The hours will fly by and when it's over, you'll have some operators anxious to try again. It's a good way to introduce non-hams to Amateur Radio, too. Why not invite a CERT or SKYWARN volunteer to sit in and make a contact? Don't forget to submit a log - no matter how small - and watch for your team's call sign in the final results. You might even get lucky and win a certificate. Could a Worked All States award be in your team's future? As important as what you are, is what you are not. There are limits to your responsibilities as an emergency communicator, and it is important to know where to draw the line. You are not a "first responder." Except in rare cases of chance, you will seldom be first on the scene. You do not need flashing lights and sirens, gold badges, or fancy uniforms. You have no authority. In most cases, you cannot make decisions for others, or make demands on the agency you serve or any other agency. The only decisions you can make are whether to participate or not, and those affecting your own health and safety. You are not in charge. You are there to temporarily fulfill the needs of an agency whose communication system is unable to completely do its job. They tell you what they need, and you do your best to comply. The Third Annual Aiken (South Carolina) ARES Go-Kit Exhibition and Contest was held this past weekend on Saturday, October 17, 2015, at the Aiken County Administration Complex. Open to all radio amateurs, the demonstration and displays were conducted from 9:30 AM until noon. Amateurs without go-kits were encouraged to attend to gain ideas for developing a go-kit for themselves. Others with go-kits were able to glean ideas for enhancing their kits. Points were awarded when the submitted go-kits were made to work in field-like conditions at the exhibit. Also, the more bands and modes shown operational, the more points awarded. All entries in the contest were to be judged by a representative from the Aiken County Emergency Management office, and the Aiken County ARES Emergency Coordinator. The Tennessee Emergency Management Agency (TEMA) held their Fall AUXCOMM exercise October 1-3. A major regional exercise held semi-annually, it involves joint participation by emergency communication professionals and AUXCOMM volunteers. It is a model of interoperability between state, county and National Guard professionals with Amateur Radio volunteers. Winlink, an Amateur Radio-based global email system that can be used when the Internet is down, was used heavily during the exercise both for communicating with external sites and for managing message flow at the incident command post. [AuxComm is comprised of operators trained under the NIMS/ICS model of emergency management for emergency communications support]. Exercise players responded to a simulated incident, coordinating response between the central incident command post located at the Tennessee Fire Academy in Bell Buckle, and multiple sites in east and west Tennessee. 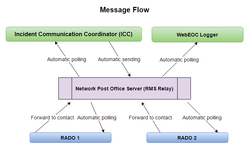 Each site connected to a Winlink Radio Message Server (RMS) within propagation range and deposited messages on a Common Message Server (CMS), which is the backbone of the Winlink store-and-forward system. This approach allowed each site to select an RMS that was easiest for them to connect to rather than requiring a direct connection to the central site. By using the store-and-forward capability, messages could be exchanged between sites without requiring simultaneous operating times. Winlink operating with SHARES callsigns on SHARES radio frequencies was used for communication with the external sites. SHARES is a federal communication organization using HF radio for communication between federal agencies, state and county agencies, National Guard units and NGOs such as American Red Cross and medical centers. It uses federal radio frequencies that are outside the ham bands. Winlink was used extensively within the central incident command post to manage message flow, with messages transferred over a MESH network, and a Winlink Network Post Office Server, the heart of the system, used rather than the RMS and CMS employed for the externa l communication sites. See figure for how the system worked.Stations, which were scattered around the campus, had connectivity with the central server through the MESH network. Four radio operator (RADO) stations operated simultaneously, handling: (1) SHARES Winlink traffic; (2) SHARES voice traffic; (3) ham Winlink traffic; and (4) ham voice traffic. Each RADO station had a computer running RMS Express with a connection to the MESH network, and had an address book contact with actual call sign being used named "ICC" (Incident Communication Coordinator). Messages addressed to ICC were directed to the network post office and messages received from external stations by the Winlink RADOs were forwarded to ICC without change. Messages received by the voice RADOs were transcribed into Winlink messages and sent to ICC. RMS Express' "background tasks" routed messages automatically. The ICC is the person responsible for processing incoming reports and requests, dispatching them for action or generating replies himself when appropriate. RMS Express used by the ICC was configured to poll the post office server in the "background" once a minute to check for pending messages. RMS Express also made it easy for the ICC to simply reply to a message. office every minute to check for incoming messages. Winlink was used extensively during the exercise both for external and internal communication. Several new Winlink features were used and tested heavily: (1) network post office server; (2) background tasks; and (3) contact entries designating post office servers. All features worked well with no reported problems.